Sometimes referred to as Archangel Blues, many believe that the first cats of the Russian Blue family were brought to Northern Europe and England in the late nineteenth century by sailors coming back home from the Archangel Isles. What we know is that this cat made its first appearance in England in 1875 and although Russian Blues were present in the US prior to World War II, the breed flourished mainly in Scandinavia and Russia, after the war ended, US breeders began the development of the Russian Blue cat we have today. The blue Russian is a very playful breed. They are known for playing fetch with their owners and most of the time they keep the game going on and on. Their playfulness though is restricted to those they trust and rarely will open up to strangers. Games are always the best place to start if you want to establish a relationship with a Russian blue. Remember not to neglect him/her during playtime and devote enough time for such activities, or you may end up with a broken relationship with your cat. Russian blues are an intelligent and curious breed, making them a perfect cat for learning tricks. I personally love to teach my cats do tricks, mainly for two reasons. One, because I have friends who believe that only dogs can do such things, I like proving them wrong. Second, because it is amazing to have a cat trained and also builds a stronger relationship between you and the animal you train. For more about teaching them new tricks you can have a look at Adopot And Shop Blog (Cat training 101). 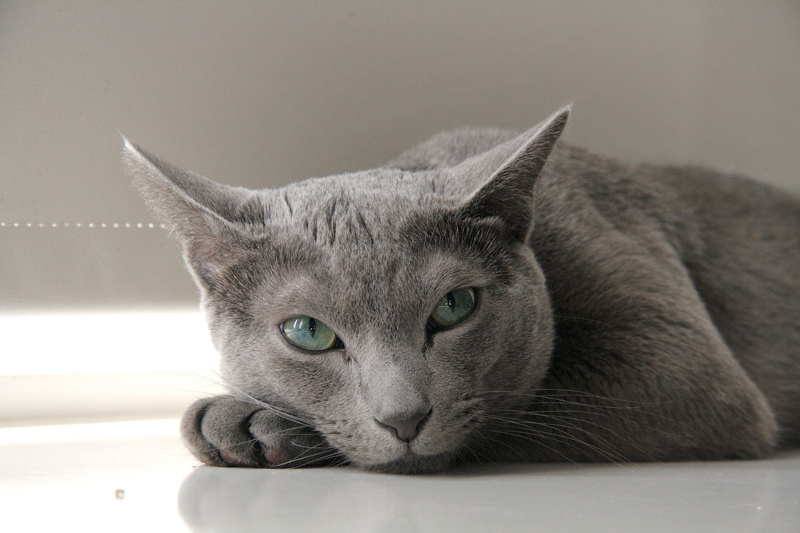 It is being told that at some point of their history, long before they have become home pets, Russian Blues were hunted for their soft and unique silver coats. This theory is supported by the modern attitudes and characteristics of russian blues, such as intelligence, quick-footness and keen senses. As a result of all these combined with the very cautious nature the Russian Blues share, make this theory seem very true. The modern Russian blues still share these characteristics with their wild ancestors and are easily frightened and startled. They are afraid of strong noises and will run and hide in safe places when they hear the vacuum cleaner for example. When in tense situations that your Russian blue is upset have this in mind, take it with you somewhere quite and calm him/her down as you would with a frightened baby. 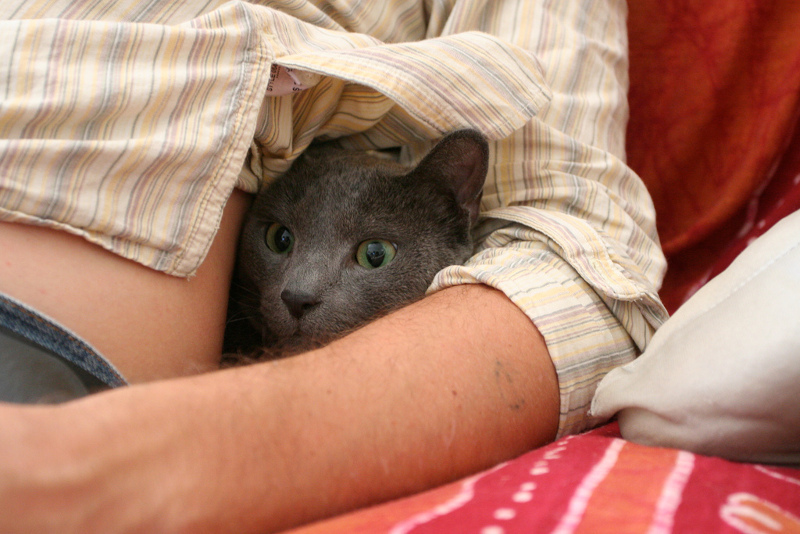 I also recommend that you have some place in your house that your Russian blue can feel safe and that is also quite, so it can retreat there when he or she feels uncomfortable. Part of their reserved personality and cautiousness is their attitude toward strangers. If it happens that you encounter a Russian blue in a friendly house, don’t be insulted if he or she never shows up. The best way to pull them out of their stashes is by finding a game that seems engaging, a toy that you move around might be very tempting and irresistible for them. Once out and starts playing, you can go on and build the relationship from there. If you have many guests in your house then it is more than recommended that you have a place for your Russian blue to rest in peace away from the noise and the people. If you have too many guests then you should think that maybe the Russian blue isn’t your type after all. Keep in mind that Russian Blues do not do well in households with large numbers of humans or pets. This is also true for your guests and frequency of their visits. 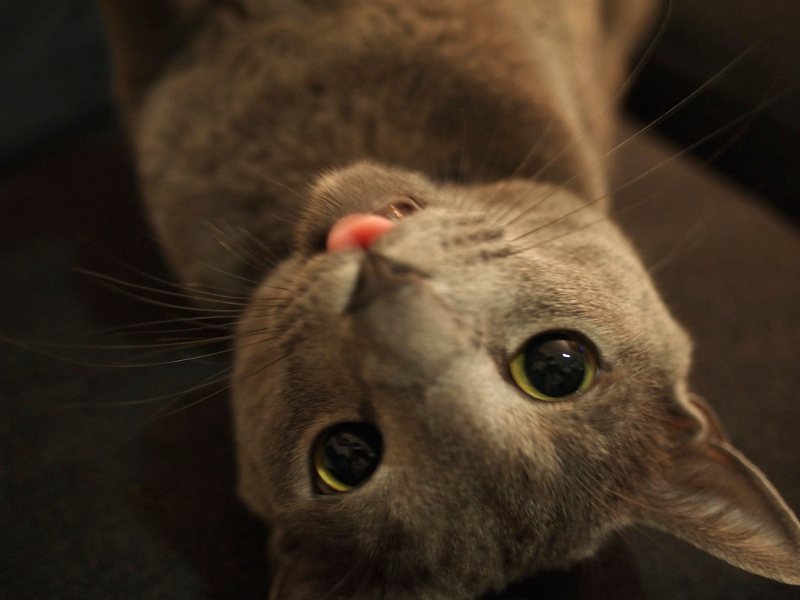 The Russian blue is a very loving and affectionate companion for those who trusts. Empathetic to human emotions, will always try to cheer you up when you are in a bad mood. The usually bond with one individual more than others and they heavily display signs of affection to others who trust too. As loving and affectionate the russian blue might be, it demands your attention too and if you ignore this need, they will be hurt. They want and must be equal members of the family, otherwise you will end up with a bad relationship and neither will enjoy the company of the other. In general Russian blues don’t have any problem being around children and other pets, by the time they bond with them, they will enjoy their company as much as they enjoy yours. Keep in mind though that because they startle easily and dislike strong sounds, loud babes won’t be a good fit, if you have such a babe, it is better to keep them apart until the baby grows up. The Russians are excellent pets for those who work and leave the home for a few hours. Russians are very independent animals and can entertain themselves for hours. If you are a busy man or woman, the russian blue might be a good fit for you. They won’t complain for leaving them alone and always welcome you with joy when you are back from work. These cats hate change, they like things predictable, this is especially true when it comes to their meal time. These cats can also be very vocal about their food, so if you want to take a nap, don’t forget to have your cat’s meal on time, or he/she won’t let you sleep. Speaking of food, you must know that Russians are in love with food, they always ask for second plate and never, ever say no to food. You should be very careful with your doses and quality if you want to keep them fit. Russians are not very keen in changes in their environment too, making them a bad candidate for people who like to travel a lot. It is also a good idea that you have a routine for the grooming needs of your Russian, such as nail clipping, mouth brushing etc. In general with this breed, the more routines you have the better of you will be. Again if you have an unpredictable, very messy life, with many travels and people come and go, the Russian blue might not be the pet for you. When it comes to hygiene Russian blues display once again their royalty. In general they are very clean animals and minimal effort is required from you for their grooming and cleaning needs. One thing you should notice and be very careful about, is the litter box. Their litter box must be kept very clean. If the box is dirty, a Russian Blue won’t hesitate to use another place! If you don’t like the idea of the litter box, you can always train your cat to use the toilet! I am not a fun of this idea for various reasons, but, it’s your house, your call. If you have a spare toilet or you don’t mind using the same toilet with your cat you can give it a try. Before you do pay a visit to this article here. If you fancy the idea of having a Russian Blue cat, kindly be advised that buying it involves a process that shouldn’t be taken lightly. You should contact a known breeder, as he will make sure that this cat is a good fit for you and your loved ones. Some wait time is expected, usually the kittens are available after three or four months of age, so they’ve had enough time with their mothers, brothers and sisters. This period is also needed for the cat to be fully vaccinated.